The Yavmir Bestiary is an ongoing project, where Michael and Radiostorm brainstorm ideas for a slavic-themed fantasy setting. More information can be found at the WoR Wiki. 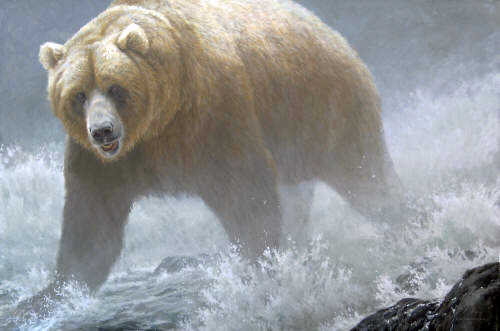 Nivkhi – often referred to as great bears or behemoths – are gigantic bears that sparsely populate Pomekh and other corners of Yavmir. Weighing upwards of 2000 pounds and standing nearly 12 feet when upright, Nivkhi are twice the size of normal brown bears. Asides from their enormous size, Nivkhi are similar to brown bears in many ways. Hibernating for up to eight months a year, their waking days are spent primarily scrounging for food. Despite being apex predators and largely thought of as carnivores, Nivkhi are actually omnivorous and quite opportunistic with their meals. In addition to meat, they can often be found gorging on grasses, berries, fungi, roots, and even the crops of a unsuspecting farmer! Living primarily solitary lives, Nivkhi only meet with others of their kind to breed and parent their young. These searches for a mate may last months or more, mainly due to the rarity and general reclusiveness of their species. This elusiveness is a trait learned from interacting with humans, who see Nivkhi as a threat to their safety and well-being. It is not uncommon for Khor communities to organize large hunting parties to strike down these great bears, and many tribes value the Nivkhi’s tough and impressive hide for armour and ceremonial garb. This fear of humans make Nivkhi incredibly unpredictable when encountered in the wild. A lucky traveler may scare the creature away before he even sees it. An unlucky one may find themselves in the claws of this powerful beast.